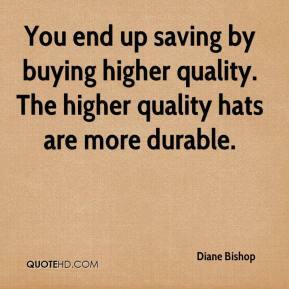 You end up saving by buying higher quality. The higher quality hats are more durable. 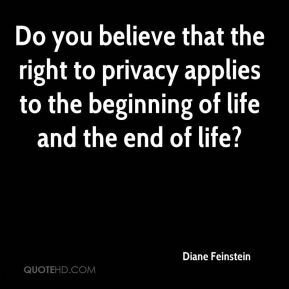 Do you believe that the right to privacy applies to the beginning of life and the end of life? 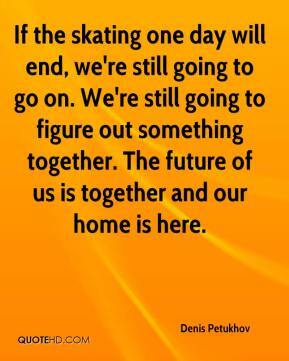 If the skating one day will end, we're still going to go on. We're still going to figure out something together. The future of us is together and our home is here. We are disappointed. It was just two teams that didn't want their seasons to end, and I think that's why it went on for so long. 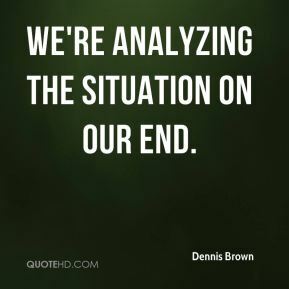 We're analyzing the situation on our end. 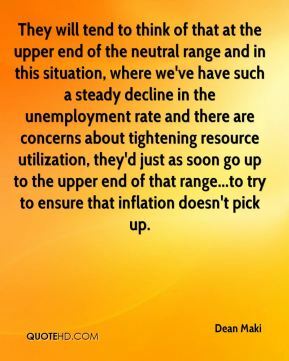 They will tend to think of that at the upper end of the neutral range and in this situation, where we've have such a steady decline in the unemployment rate and there are concerns about tightening resource utilization, they'd just as soon go up to the upper end of that range...to try to ensure that inflation doesn't pick up. 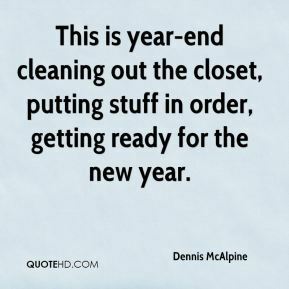 This is year-end cleaning out the closet, putting stuff in order, getting ready for the new year. Baylor was awesome at the foul line. They stepped up at the end and made them like butter. 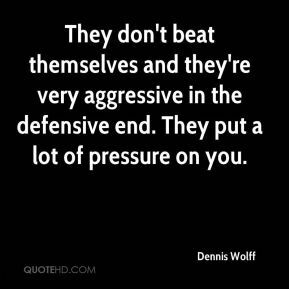 They don't beat themselves and they're very aggressive in the defensive end. They put a lot of pressure on you. 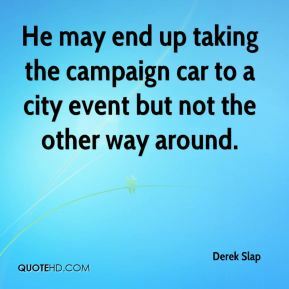 He may end up taking the campaign car to a city event but not the other way around. You can say that maybe his first two years he got the short end of the stick playing wise. But never once did he complain. Never once did he stop working. 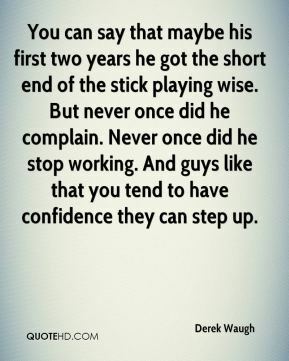 And guys like that you tend to have confidence they can step up. 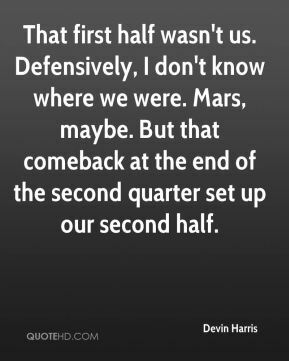 We cut the lead and started coming back, but we just had some mental (lapses) on defense at the end and that cost us the game. It's been a lot of blood, sweat and tears to this point. It's a great, great way to end the season and I've said it before, this is the way these three should go out. They deserve every recognition and everything that's come to them because they've worked hard, been great leaders and we've beaten some very good teams to get to this point. 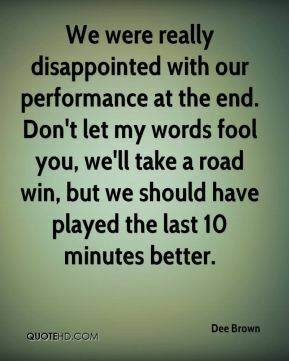 We were really disappointed with our performance at the end. 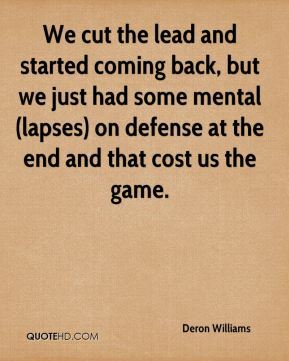 Don't let my words fool you, we'll take a road win, but we should have played the last 10 minutes better. That first half wasn't us. Defensively, I don't know where we were. Mars, maybe. But that comeback at the end of the second quarter set up our second half. 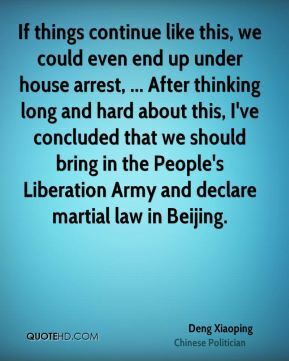 If things continue like this, we could even end up under house arrest, ... After thinking long and hard about this, I've concluded that we should bring in the People's Liberation Army and declare martial law in Beijing. I played beside him on offense. 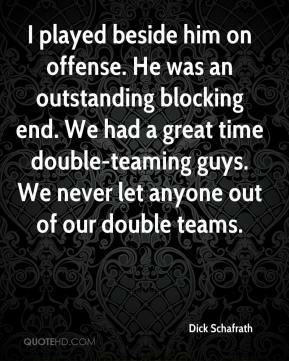 He was an outstanding blocking end. We had a great time double-teaming guys. We never let anyone out of our double teams. 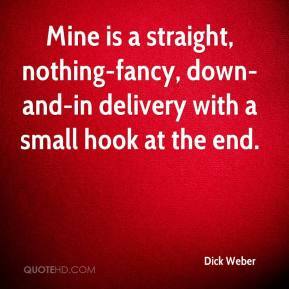 Mine is a straight, nothing-fancy, down-and-in delivery with a small hook at the end. 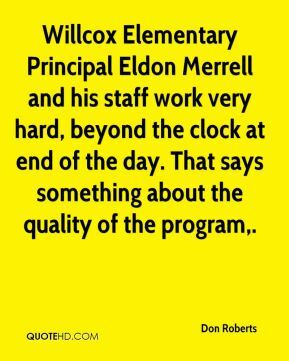 Willcox Elementary Principal Eldon Merrell and his staff work very hard, beyond the clock at end of the day. That says something about the quality of the program. 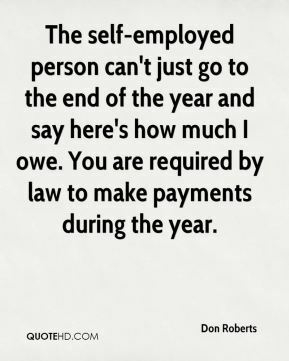 The self-employed person can't just go to the end of the year and say here's how much I owe. You are required by law to make payments during the year. 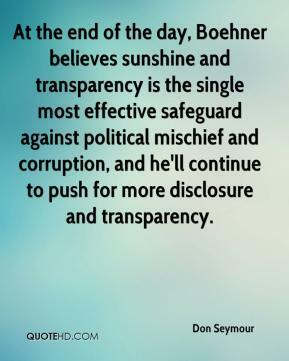 At the end of the day, Boehner believes sunshine and transparency is the single most effective safeguard against political mischief and corruption, and he'll continue to push for more disclosure and transparency. 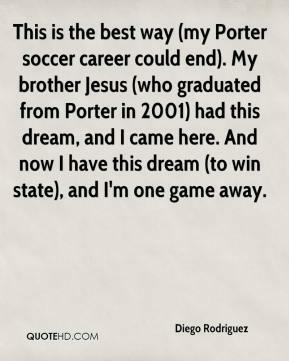 This is the best way (my Porter soccer career could end). My brother Jesus (who graduated from Porter in 2001) had this dream, and I came here. And now I have this dream (to win state), and I'm one game away. 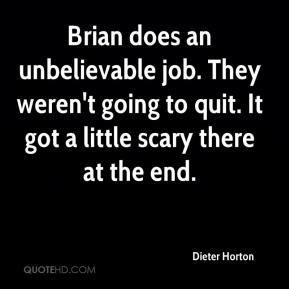 Brian does an unbelievable job. They weren't going to quit. It got a little scary there at the end. 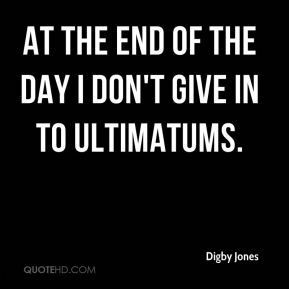 At the end of the day I don't give in to ultimatums. 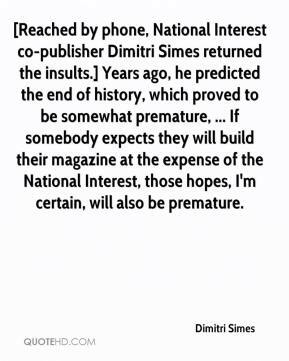 [Reached by phone, National Interest co-publisher Dimitri Simes returned the insults.] Years ago, he predicted the end of history, which proved to be somewhat premature, ... If somebody expects they will build their magazine at the expense of the National Interest, those hopes, I'm certain, will also be premature.